It is not quite easy to look for the best convertible car seat for small cars, particularly when you, yourself owns the same size of vehicle. The room’s smaller and your movements are limited. You know that its size limits you with all the other stuff you need; all the other car essentials for your child. You cannot just grab anything you want and put them up on your car. A convertible car seat is one of the essentials you know your child should have but, how would you know if it fits your car? You definitely do not want to waste some bucks with the wrong convertible car seat. Manufacturers offer various types of convertible car seats that would meet your needs. However, looking for the best convertible car seat for small cars might not be as easy as what you think it is. Though there are a lot of car seats on the market, only certain types are compatible with your vehicle. You need to carefully consider some factors to get the best one for your child. That could be one of the downsides of having a small car. But, the good news is, there are convertible car seats that are customized to fit a small car like yours. We would like to help you find the best convertible car seats for small cars and so, we have compiled the 5 best car seats on the market. What are the best convertible car seats for small cars, then? 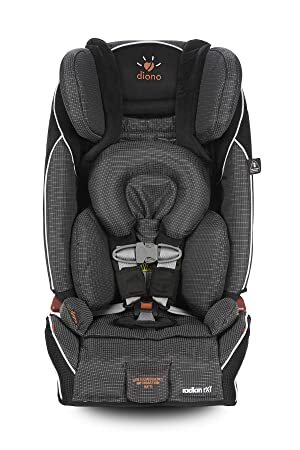 Diono Radian RXT All-In-One Convertible Car Seat Rear-facing - 5 to 45 lbs. Booster seat - 50 to 120 lbs. Britax USA Boulevard ClickTight Convertible Car Seat Rear-facing - 5 to 40 lbs. Maxi-CosiPria 70 Convertible Car Seat Rear-facing - 9 to 40 lbs. Forward-facing - 22 to 70 lbs. 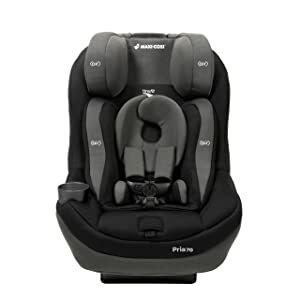 GracoSmartSeat All-in-One Car Seat Rear-facing - 5 to 40 lbs. Booster seat - 30 to 100 lbs. Maxi-CosiPria 70 with Tiny Fit Convertible Car Seat Rear-facing - 4 to 40 lbs. The Diono Radian RXT All-in-One Convertible car seat only weighs 22 pounds. It is lightweight and is exceptionally slimwhich can be folded whenever you need to bring it along your travels. With its compact and slim size, you can consider this as one of your options for your small vehicle. It is easy to store and easy to carry. With its lightweight feature and folding design doesn’t mean it is less sturdy than the other brands. It is built with full steel frame which makes it one of the safest convertible car seats today. Aside from its sturdy construction, it also assures great comfort. 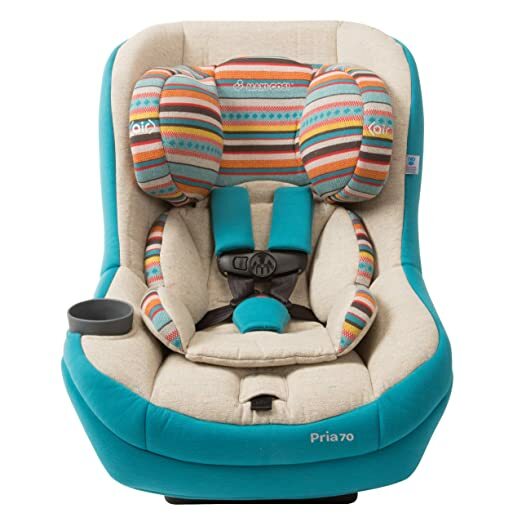 It has infant body support cushions and memory foam with adjustable headrest and reinforced sidewalls. The infant body support is also tucked under the seat to ensure the baby’s comfort and safety. The EPS foam and energy-absorbing harness system secures the child while on the seat. This all-in-one convertible car seat can be transitioned to rear-facing, forward-facing and booster seat. For extended rear-facing, children from 5 to 45 pounds in a 5-point harness are allowed; 20 to 80 pounds in a 5-point harness is the total weight limit for forward-facing seat and 50 to 120 pounds is the total weight limit for the booster seat. Most of the users are quite impressed with the Diono’s quality and performance. The positive reviews mainly pointed out the product’s sturdy construction, how compact and lightweight it is and how easy it is to carry. Most of the users also prefer this for their small cars. 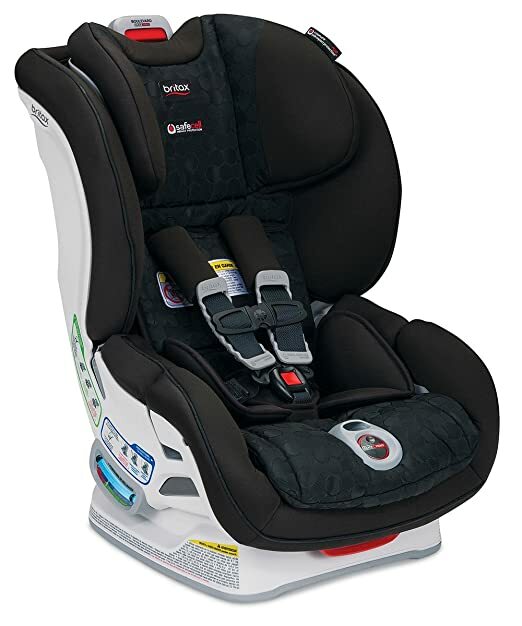 Britax is one of the best brands of convertible car seats. With its great quality, they have come up with customized convertible car seats for small vehicles. One of the best convertible car seats for small cars and most preferred by consumers, the Britax USA Boulevard ClickTight Convertible Car Seatonly weighs 24 pounds with a minimum weight limit of 5 pounds and maximum weight of 65 pounds. It is transitioned from rear-facing seat to forward-facing. Britax assures great comfort for your infant. The Britax convertible seat is also powered up with impressive safety features, prioritizes safety, rather. The SafeCell Impact Protection is a safety system which includes a steel-frame, energy-absorbing base and V-shaped tether. All of which works to minimize seat rotation and staged-release stitches which keeps the seat stable even during a collision. Its installation safety is also the safest and the simplest technology in the market. It has a sturdy build yet compact; suitable for your small vehicle. It also features SafeCell Impact Absorbing Harness Pads, Click and Safe Harness Snug indicator and EZ buckle system. The consumer reviews and ratings highlighted the car seat’s easy installation and excellent performance. The safety features also stood out and impressively commended. The downside is its price. It is more expensive compared to other brands. However, it has assured great quality, comfort and superior safety. Most of the users recommended this type of seat for parents with infants. Its design must be the cutest and most adorable one you’ve seen! With its premium fabric and creative design and prints come with a safety system your little one can surely depend on. The Maxi-CosiPria 70 only weighs 23 pounds which your small car can surely accommodate. It is also specially designed to fit better in your car which gives more room for the passengers to stretch out in the front seats! It has an advanced air cushion system for your child’s head protection and perfect fit one-hand harness for height adjustment with micro-adjustments included. The transition from rear-facing to forward-facing is easy and hassle-free. The Maxi-CosiPria 70 convertible car seat provides the weight limit for each type, the rear-facing and forward-facing seat. 9 to 40 pounds is allowed for the rear-facing seat while 22 to 70 pounds is for the forward-facing seat. The installation and transition are definitely easy with the deep rear-facing adjustment. Those parents who bought the Maxi-CosiPriaconvertible car seat thought of this as the best rear facing convertible car seat for small cars. The size is just right for their infant and perfectly fits in their small vehicle. They also pointed out the installation, performance and comfort which were all commended outstanding. The creative prints and premium fabric had also been the users’ favorites. The Maxi-CosiPria is available in Bohemian Blue and Bohemian Red colors. Looking for a compact all-in-one convertible car seat? The GracoSmartSeat All-in-One car seat could be one of your options for your vehicle. It is is loaded up with impressive safety features and comfortable support which your little one will surely love. Making every ride cozy and safe. The convertible seat’s structure is built with plastic and metal frames making it durable and stable even when collision occurs. It features integrated harness storage compartment, easy-to-read level indicator, quick and easy adjustment, 6 positions for adjustable head rest, 5 recline positions, energy absorbing foam liner, flip-up armrests and cup holders. 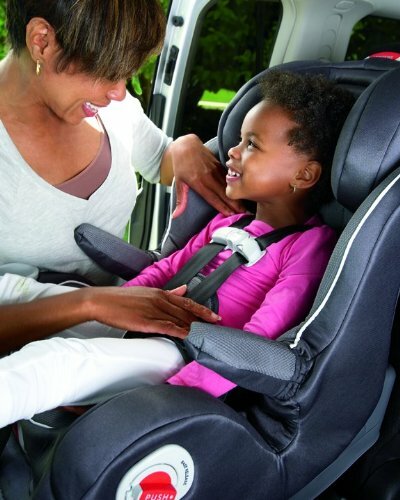 The amazing features will keep your child protected and safe while on the ride. When you need to clear those spills and dirt away, it is easy to clean and store. The Graco brand is also one of the top brands for convertible car seats and this SmartSeat All-in-one car seat could be your practical option for your growing child. The installation and transition is hassle-free. However, to make it work effectively, the user should abide by the weight and age limits. 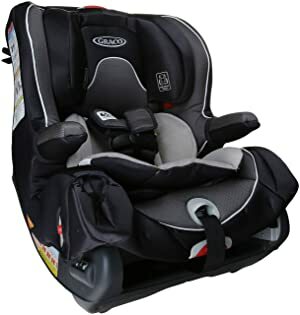 For a rear-facing convertible seat with a 5-point harness, the allowed weight is between 5 to 40 pounds; 20 to 65 pounds for forward-facing seat with harness; and 30 to 100 pounds for forward facing as a belt-positioning booster seat. The size sure is not as compact as the previous ones in our list but it is most commended with its safety features and quality. Some users have had this seat for a few years yet still durable and reliable with long drives. However, some have complained about the weight stating how heavy the seat is. With the safety features as the priority and if you don’t mind heavier convertible car seats, this could be a great option. Might not be your choice for the best convertible car seat for small cars due to its size and weight, but probably be the best one for your child’s superior safety. Labeled as a Tiny Fit, this Maxi CosiPria 70 Tiny Fit car seat sure is great for your small vehicle. The product only weighs 24 pounds. It is indeed recommended for small cars due to its size and perfect fit, parents can keep their infants fully secured and comfortable. It is transitioned from rear-facing to forward-facing seat. The weight limit for rear-facing, on the other hand, is between 4 to 40 pounds and 222 to 70 pounds for forward-facing seat. The Maxi-CosiPria convertible car seat features a One Click latch System with easy click in and release for easy installation. The Flextech construction system enables the car seat for advanced crash energy management. It immediately reduces impact forces through the precise release of air. It also has cup holders with grips to hold and secure your child’s beverages. The feedback from the consumers, primarily those who own smaller vehicles, have a mishmash of reactions. Some do like it and even recommended the Maxi-CosiPria car seat for small vehicles. According to the consumers, the size was just the right fit even for a hatchback but some found it really huge due to its size and the paddings make it look bigger. However, many had been satisfied with its performance because of the comfort it provides. Once you had gone over our list, you probably have your ideas and options of which convertible car seat is the best for your vehicle. You might have also decided which product to choose and buy. Nonetheless, there are some reminders you need to keep in mind. If you have read about the types of convertible car seats to buy, there are also these types of car seats you should avoid. No, we won’t be talking about certain brands. Rather, we would discuss what specific details or structure of a convertible car seat you should avoid. Small vehicles, then again, have smaller room and you and your child’s movements might also be limited. Hence, it would be much better to take note of these details before taking your purchase. BULKY. You only have smaller room or space inside your car and you would not want to consume all the remaining seats with a convertible car seat. A bulky convertible car seat would not be appropriate or practical at all. It would take too much space which may not provide any more room for the passengers and comfortable space for your child’s feet to stretch out! HEAVY. Another no-no.Heavy convertible car seats would not be appropriate for your small vehicle. This detail may be disregarded by some parents because, as what they say, their child’s comfort and safety are the main priority. Well, of course, it is but if your seat is too heavy, then it won’t be preferred for the vehicle. The heavy luggage has already added weight to your vehicle’s weight capacity and you would not want to exceed the limit with another heavy equipment. Especially if it is a long ride, you need something that is compact and travel-friendly. You don’t want to get stuck in the middle of nowhere! HUGE. One of the mistakes parents make in choosing a convertible car seat is the size or height. You’ve got to take note of the dimensions and make sure that it would fit perfectly in your vehicle. You should be able to get the car seat in and out of the vehicle easily. Determine the size and weight of the car seat. If possible, check the dimensions. Consider your vehicle’s available space. If you want to be more precise, you can take some measurements. Do not settle only for the best features. Always consider your vehicle’s capacity. Don’t take advantage of it. Remember, your vehicle is your primary means for all your trips, quick errands and long rides. Load it up according to its limit and don’t exceed. Finding the best convertible car seat for small cars do need some precautions too. Choosing a car seat with the outstanding features does not always mean it is the best one for your vehicle. You should consider all the reminders and factors mentioned above. Check the best seats in the list. Avoid particular car seats with specific details that are inappropriate for your vehicle. Take some time to research and consider the reviews. Considering all these factors, you’ll be able to come up with the best and most practical decision both for your vehicle and your child.